One of the great things about living in Murrells Inlet is being able to put your boat in the creek at the Murrells Inlet public boat landing and going out for a great day of fishing especially now that the yellow butterflies are floating in the air signaling the perfect fishing weather and influx of the yearly spot migration. From the recent number of boats filling the the creek and updates on area fishing reports it is no mystery now is a great time for fishing in Murrells Inlet. 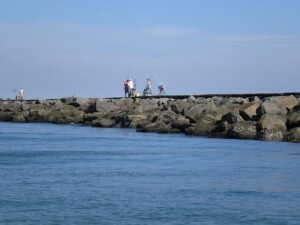 Even if you don’t have a boat you can still access the good fishing available in Murrells Inlet by hitting Huntington Beach State Park and fishing off the north jetty or better yet hit the pier off the Murrells Inlet Marshwalk. Make sure to take plenty of bait! 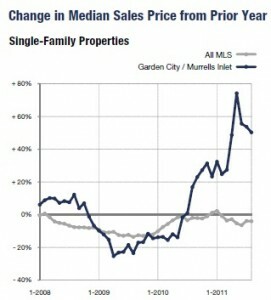 Are Murrells Inlet Home Prices Stabilizing? Murrells Inlet home sale prices appear to be holding with a median sale price of $240,175 for single family homes sold in September up slightly over the same month in 2010 when the median sale price was $238,416. Along with the upward price trend the number of homes sold also increased in September with 40 single family homes sold in Murrells Inlet. August Inlet home sales also showed an increase in median sale price so are Murrells Inlet home sale prices stabilizing? The answer is they appear to be swinging upward but there is more to the picture than home sale prices since Murrells Inlet homes for sale also play a factor in where home sale prices might be headed for the remainder of 2011 and into 2012. Currently there are 459 single family homes listed in the Murrells Inlet zip code and 85 with contracts but only 8 pending cash sales. The active listings represent at least 1 years inventory and if listings continue to climb into the winter months when the number of sales typically falls we could see a less stable market going forward but for now Murrells Inlet home sale prices appear to be stable. If you are thinking of buying a Murrells Inlet home start your search today! Copyright©2011 Sandra Bundy, Broker-in-Charge, B&P, Inc. Serving the Pee Dee and Grand Strand of South Carolina.